Victims of sexual assault at Brandon University are required to sign a behavioural contract that forces them to say nothing about the assault except to counsellors. We Believe Survivors, a campus group that was formed just 10 days ago, discovered the existence of the contract on a forum it set up for students to post anonymously about their stories of sexual violence on campus. Stefon Irvine, one of the group's organizers, said the contract re-victimizes assault survivors. "One student mentioned the behavioural contract," he said. "They were, thankfully, strong enough to come forward and offer that behavioural contract as a means for change and discussion." 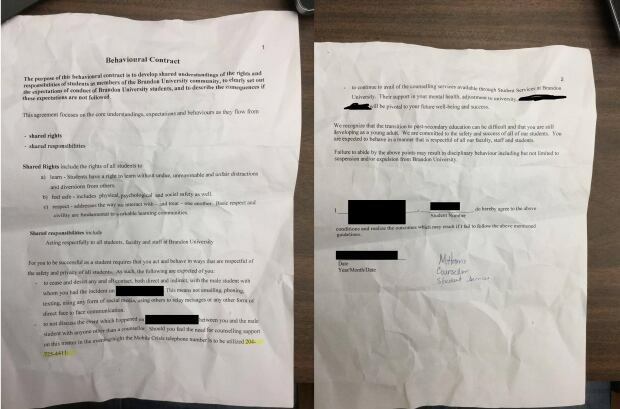 The contract, which Brandon University confirms is authentic, spells out that the signer cannot have contact with the other person involved in an incident and that they are not to discuss what happened with anyone else other than a counsellor. Students are threatened with suspension or expulsion if they breach those conditions, according to a copy of the document obtained by CBC News. "It was really unfortunate knowing that this form existed," Irvine said. "Just knowing that the culture of silence on victims and victim blaming is so huge in our community." "It was really concerning knowing that our university is more interested in keeping their name clean and pure rather than talking about things as serious as sexual violence," he added. Brandon University issued a news release on Tuesday morning, saying a statement will be released "shortly" about the matter. Dr. Corinne Mason, co-ordinator for the Brandon University Gender and Women's Studies program, said she wasn't surprised to hear such a document existed. "This 'gag order' is not surprising given the culture of silencing victims on all Canadian university campuses," Mason said in a statement Monday. "This 'gag order' treats survivors and perpetrators as equals in the 'incident,' and it treats the person who reports sexual assault in a disciplinary manner." "By this letter, one could not even call the sexual assault crisis line at Klinic without risking suspension or expulsion," the statement continued. "This letter was obviously written without much knowledge of sexual assault, and without survivors' needs in mind." Irvine fears that the terms of the contract will fall most heavily on those studying at Brandon University from abroad or others who might be at risk of having their funding cut. 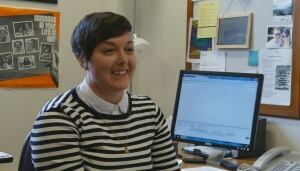 CBC News spoke with a sexual assault victim who signed one of the contracts. She was 17 when she was sexually assaulted in a residence at Brandon University in September 2015, she said. "I was very suspicious of this because I felt like I was not in a place that I had to sign," said the first-year student. She reported the incident to school staff and did sign the document swearing her to silence that same month but now wants to tell her story. The student said she didn't get the help she needed from the school. "I wish that those few days after it happened I was not left alone. That I wasn't told I was a bad girl," she said, holding back tears. She said she was told that her incident was small compared to others. "I found the help I need and it's not been with the university," she said. She sought help at a clinic off campus in downtown Brandon. The woman said she went to police about a month later. Brandon police confirmed they investigated a sexual assault complaint at BU last fall, but would not confirm it was this particular case. In the case they investigated, both people involved were interviewed and the police consulted with Crown attorneys. In the end, no charges were laid, Sgt. Bill Brown said. The woman, who still sees the other student in the hallway from time to time, plans to leave Brandon for another province this summer and says she doesn't plan to return. Meanwhile, Brandon University defends use of the behavioural contract. "Certainly behavioural contracts are meant to protect, they're not meant to victimize or re-victimize," said Tom Brophy, associate vice-president of student services at BU. "So behavioural contracts are there to protect students, that's what we endeavour to do." In the more than two years Brophy has been with the school, he says only three have been issued. And suspension or expulsion would only be a last resort. "We certainly want to have our students feel safe to come forward to do that [report sexual assault and sexual violence]," he said. "It doesn't mean we don't have room to improve. I think we do and we're working towards that." The university is in the midst of creating a sexual-assault policy. Just one sexual assault has been reported to administration this school year so far, Brophy said. However, that doesn't mean there haven't been others that weren't reported, he added. Irvine has said he would prefer not to have a behavioural contract and have a different approach to victims of sexual assault. "It should be survivor-centred, meaning the first line of contact should be police, should be survivor-centred counselling sessions, disciplinary actions for students involved," he said. "You should never be bound by terms of agreement on how much of your story you should be allowed to say," Irvine said. An expert in human rights says Brandon University has the authority to ask victims of sexual assault to agree to a gag order. Karen Busby, a law professor at the University of Manitoba and the director of the university's Centre for Human Rights Research, said she was not surprised to hear about the contract. "What people need to know is this is actually a product of a provincial law," she said. "Workplace health and safety regulations that govern all employers — not just universities, but all employers — prohibit the disclosure of the name of the complainant or alleged harasser or any circumstances relating to a complaint, except in very limited circumstances such as seeking legal advice or counselling advice." The provincial regulation doesn't require the signing of a contract, but does restrict anyone who's involved in an investigation from talking about the investigation, she said. "The University of Manitoba policy specifically says that anyone involved in a complaint process should not discuss the details of the complaint or the response of others. And the gag order remains in place indefinitely, even after the investigation is complete," Busby added. "To the best of my knowledge no one's required to sign a contract saying they won't disclose, but the policy does say if you do breach confidentiality you might be subject to disciplinary action. "If a student asked me for advice, I might say don't sign the contract; there's nothing that requires you to sign the contract. But having said that, the provincial law says you're prohibited from disclosing any names or the circumstances relating to the complaint, so you're in a really tricky situation about your ability to talk about it more broadly."